Bishop Gregory will be licensing Juliet as a Vicar in the Mission Area. Please come and support Juliet at this special service to begin her new role in the Mission Area. There is some parking available next to the church. Entry and refreshments free of charge to all. Open to all and especially those who are living with Dementia, their carers, loved ones and friends. Support available for those who would like any further information regarding Dementia. All Saints was consecrated by the Bishop of St Asaph on All Saints’ Day 1st November 1899. It was built by The Rt Hon Lady Henrietta Augusta Mostyn of Gloddaeth in memory of her father and mother the Earl and Countess of Abergavenny. I often amuse myself by commenting to visitors that she must have had very strong arms! A report of the opening service and the titled people in attendance reads like a scene from “Downton Abbey”. It records that “the interior of the church was crowded and overflowing with a fashionable and representative congregation” and “adorned with greenhouse ferns, palms and flowery plants very tastefully disposed”! I wouldn’t dare deny that Betty’s flower displays match anything then, but times have certainly changed. All Saints Church was once the only building on the hill. It could be seen for miles around. But although the commemoration stone is still visible up close, the church is now surrounded by “luxury apartments” and a Sea Cadet building that looks more like a 1960s office store. The church is all but invisible from the main road. “We didn’t realise there was a church there”, a group of walkers said to me as our paths crossed on the Vardre. Commensurate with other church buildings of a similar age we have in the last two or three years had our share of repairs. The front wall and gates had to be rebuilt and restored after a car crashed into them; repairs were needed to the roof over the organ loft to prevent it raining in; and now storm damage to the church tower and the falling over of the cockerel weather vane (which complicates matters by being part of our lightning conductor system)! Our electrics have to be upgraded following the Quinquennial inspection and, to boot, we also have a problem with water drainage from the cellar! Nevertheless we have had some positives. We have had a kitchenette and toilet installed and new chairs and tables in the north aisle of the church - what is now in effect a functioning café! It is intended that much use is made of this space by those from within and outside the church. As well as serving tea, coffee and biscuits after services we have held special events such as the recent “Soup Sunday”, a frugal meal to mark the start of Lent. 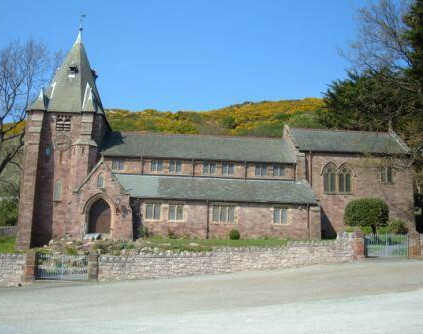 We also hope to encourage groups outside of the church to make use of our facilities the first of which is the monthly Deganwy Dementia Café which started in March of this year. As with most churches we are patently aware of our demographics. We have managed though to attract new members and have maintained our numbers in recent years. We are trying ways to publicise events and services through social media, local advertising, leafleting and using notice boards. We can but try!